Even with -15 degrees windchills some snow fun can be had! The girls and dogs played for 15 minutes outside, shielded from the brunt of a 20-25mph north wind. Down because my running miles were low (67) and almost 1/2 of a year ago. Steady because I hit a target time goal of 26-30 hours each month or 50-55 minutes each day. Rowing and CrossFit/Fitness categories – but I’m not picky. It’s nice to have a utility that lets me track it all. 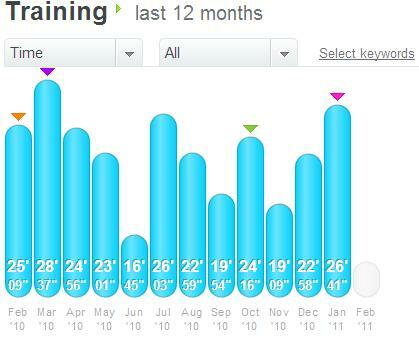 February may have a different mix of aerobic miles. My plan though is a little more swimming, less spinning, running up to 90-100 miles, same row and 12 CrossFit WOD”s. The idea is flexibility, intensity and consistency. I would rather hit rowing/bike/swim at 100% than just log miles on ice (though sometimes I’ll use the mental discipline and crank some miles in -10 weather). My primary exercise outcome measure from 1992-2009, no longer the case. Similarly if my shoulders are screaming after a CrossFit WOD (lets say pull up, thruster or wall ball intensive one) I’ll rest from swimming and rowing for a day or two. I’ll bike or run instead. Over the last year I’ve found rowing to be the closest substitute for running in terms of distance and effort. Quick question for you all, how do you gauge your exercise outcome and success? 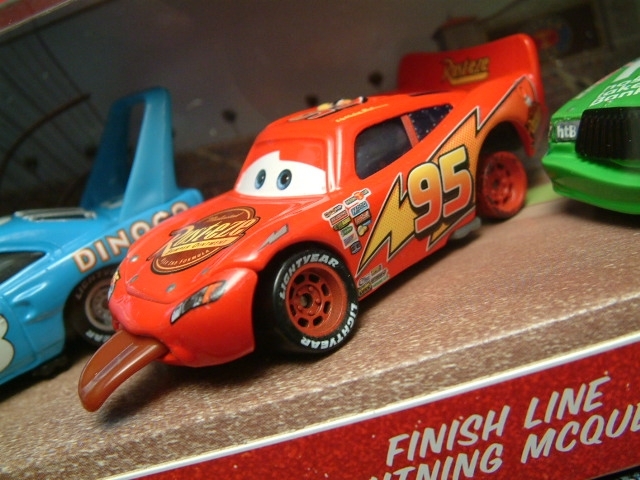 Racing like Lightning McQueen - Cha Ching! 52 weeks of CrossFit Workouts Of the Day and Triathlon Training. 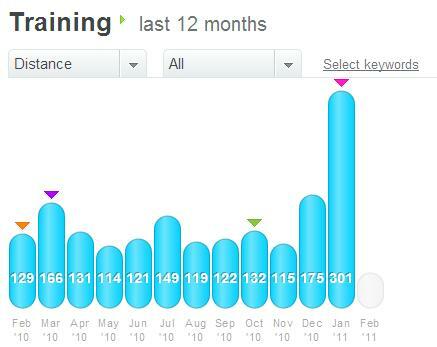 Add in the P90x round from October of 2009 to January 17 of 2010 and that’s a solid 65 week test of cross training. The detailed statistics are available in a year end capper. I also shared some candid results in the “Proof Positive of Training Change after the Tulsa Marathon”. So there’s been enough summarizing already! The last five weeks were a true rush of activity – catching up on some cycle, row and swim miles. I have been ramping up the CrossFit WOD’s in preparation of returning to CrossFit Lincoln (which began last week!). Through all of that and the normal Christmas – New Year’s activity rush I felt comfortable and strong. So without further ado – here’s the highlights. For the next 52 weeks, I’ll pop in a quick blurb from time to time regarding my weekly training. Feel free to join me on Daily Miles for the weekly logs. I’ve been looking at a lot, and I mean a lot, of aerobic / anaerobic/ strength training exercises and will be share much more on those in 2011. So keep your browsers open and check back! Insightful article on the Importance of Play for Motor / Muscular learning. The better movement blog also has some in-depth explanation of the Feldenkrais Method – a wonderful resource for improving muscle coordination and movement. Training and Weight: Does This Marathon Make Me Look Fat? Capturing some good reference material via Sharethis – a ton of tools like it. This one addresses a common, strange quirk from running – the fat that stores up – typically in the oblique/ abdomen area. Quick post to share a series of workouts for the Road Warrior by CrossFit affiliate Crossfit Delray Beach . Call them a Road Warrior WOD. Here’s my top 3 with a Crossfit Endurance inspired twist for Long Course (2-3hrs) and Ultra Course (> 3hrs) training – aka triathlon. Be sure to check out the entire list. Crossfit Delray Beach . The idea is travel does not mean skip your WOD! Keep sharp physically which will help ensure mental sharpness as well. Snow Shoveling –0 but more to come! This was a miss and miss week for P90x as it took a back seat to ensuring I met some fun mileage goals (triathlon disciplines) for 2009. So lots of running, a bit of cycling and 1,000 yards in the pool. Result was 2 P90x upper body workouts and 2 Ab RiperX. This brings up the, what if I miss a week? My thought, just add that on the end (so your P90x is P97x). It seems the majority of Beach Body enthusiasts run through at least 2 P90x rotations and then jump into Insanity, etc. Sunday, Day 64 – Rest Day – easy run to recover. Monday, Day 65 – Ran a shade under 6 in the ice. Lost a YakTrax along the way. Tuesday, Day 66 – 12 miles of running, 20+ of spinning and Chest and Triceps as well as Ab RiperX. 2 more days in 2009 for working out and yes, a fun day at the Y. I’ve found myself taking the book to the Y more than hitting the vid’s of late. And that’s ok! Wednesday, Day 67 – 1,000 yard swim. Was flat out tired after yesterday’s combo workout of 4 hours. Thursday, Day 68 – New Year’s Eve Day – 9+ mile run to notch 1,500 running miles in 2009 and 2,000+ total! Friday, Day 69 (1/1/2001) – Rest day – drove to GI with family to visiting an aunt-in-law in hospice. Good day to spend with family and read. Saturday, Day 70 – Braving the chill again – 5+ miles with Laura while Tony faithfully rode the bike. Warmed up with KenpoX before the run. Added weights to the routine. Back at the end of Week 11 with 3 or 4, P90x workouts. Actual, 2,004 total miles: 1,500 running (29 per week), 24 swimming or 3,200 laps, 480+ bike. Lincoln Marathon – 4:32; Pikes Peak Double! 4:43 and 9:20. HyVee Long Course Triathlon – Finish. Des Moines Marathon 4:31. Plus near 1/2 marathon PR @ Grand Island in August (1:44), 1/2 marathon course PR in Omaha (1:46), 5 mile and 5k times – best of this decade. Still not under 22 minutes on 5k or 37 on 5 mile. First open water 1k raced (where I got smoked ;-))! Finally began P90x in October to build and repair core/pillar strength. Quick analysis. Was able to reach mileage goals though much more biking than planned and far less swimming. Finished the Pikes Peak Double and Lincoln / Des Moines Marathons but 20 minutes slower than planned. Enjoyed several other races as well! The core strength training is paying dividends in body / muscle cut and hopefully downstream in racing as well. Feel much stronger. Now for 2010! The bullet list is below. My goal is to continue total body conditioning (6 pack abs and guns! ), achieve PR’s or near PR’s from the mid 90s, continue better nutrition, have fun, further triathlon capability and avoid overuse injuries. Running 1,750 to 1,800 running (33 per week or 20% increase). Bring P90x to summer hill workouts! Possible 1 round of “Insanity” to learn techniques for track. Other races with kids for fun!